"With the Mandate to Preach the Gospel of Christ in the Power and Authority of the Holy Spirit to the Nations of the World, Exercising All the Dimensions of the Word and Prayer". Bishop, apart from his busy ministry and church schedule, is available to teach, preach and minister from house groups to large and small conferences, and also at church and crusade meetings. 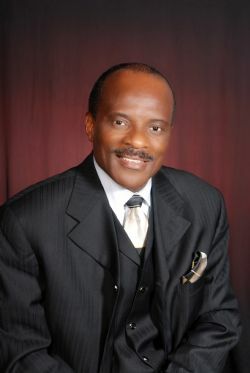 A seasoned and fine intellect man of God, Bishop Morgan is a member and a recognized ordained minister of the Assemblies of God of United Kingdom and Ireland. A former Accounting Executive and Bible College Graduate, Bishop Morgan has been in full time ministry for 30 consecutive years. A well traveled man, Bishop Morgan's ministry has taken him to nations in Europe, Africa and many states in the continental USA. Often called "The Preacher of Righteousness", Bishop Morgan handles and delivers the word of God with captivating charisma and uncompromising fervor. Mature and Equilibrious in operating in the Gifts and Fruit of the Holy Spirit, Bishop Morgan holds the office of Apostle, Prophet, and Teacher and is evidently God's true gift to all the nations of the world. Lastly, Bishop Morgan's ministry is characterized by love, compassion, sincerity, truth, mercy, grace and integrity. To engage Bishop Peter Morgan in ministry assignments, please click here. To listen to more messages by Bishop Morgan, click here.